Vantablack, created and engineered to near perfection by Surrey Nanosystems created a material so dark, nearly no detectable can escape it. The name stands for Vertically Aligned Nanotube Array black and it is currently the darkest material in the world. The material is lined with billions of aligned and equally spaced " high-aspect-ratio carbon nanotubes (CNTs)", say the creators of Vantablack. The material allows photons, or other radiation, to pass between the CNTs where the tubes cause the radiation (light or otherwise) to reflect repeatedly until nearly all of the radiation is absorbed and transform into heat. The heat created is nearly undetectable as it is quickly conducted to the underlying substrate and then dissipated. The arrangement of the Vantablack tubes is dispersed over the material with a low material density, accumulation only 0.05% of the coating. As a direct result, a minute quantity of the incident radiation reaches the top portions of the tubes consequently minimizing the amount of radiation that can be reflected back to an observer. While the previous coating absorbed 99.965% of light (750nm wavelength), a new variant absorbed so much light, the instruments utilized for light measurement were not sensitive enough to detect any light being reflected. "UV, Visible and IR absorption - Absorption works from UV (200-350 nm wavelength), through the visible (350-700nm) and into the far infrared (>16 microns) spectrum, with no spectral features." The composition of CNTs comprises of hollow structures created from one or more atom-thick sheets of carbon. The nanotubes are also incredibly thin, reaching only one fiftieth of one millionth (!) of a meter in diameter. The qualities of the material are attractive for engineering structures that require low-reflectivity and high-emissivity. However, its superb ability in light absorption is not the only desirable property. Due to the extremely dispersed arrangement of the tubes, allowing more than 99% of the space to be free, the material is extremely light. However, it is also incredibly effective requiring a typical coating of around 20 to 30 microns for maximum efficiency. Just one square meter weighs 2.5g. The coating and CNTs within have a high modulus of elasticity enabling the material to bend and flex to a great degree. The elasticity formulates a robust material able to retain a high degree of function within extreme environments containing shock and vibration. The bonds of the CNTs' to the substrate are also impeccably strong, giving it a high tolerance to thermal cycling, shock or vibration. In an experiment where the material was submerged in into liquid Nitrogen at -196°C and then transferring to a 300°C hot plate in air, nearly no effect was noted with no changes to the properties of the CNTs. As a result of its high tolerance, there are virtually no out-gasses. Vantablack is also surprisingly super-hydrophobic, which is unlike most other black coatings. Even when submerged in water, no impact is resulted on the optical characteristics. The predominant application of the material will likely see a high degree of use within aerospace industries where components remain subject to high degrees of thermal cycling, mechanical shock, vibration and exposure to high vacuum. 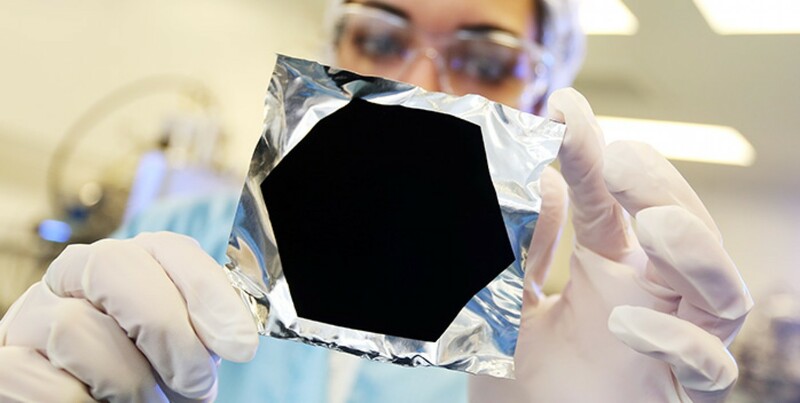 Vantabalck easily absorbs nearly all light across not only visible but also IR spectra. That combined with its superb ability to easily conform and bond perfectly with aluminum alloys make it a supreme candidate for space instruments and crafts. The material is currently being applied to many space-bound instruments and components as further development and research continues.